Lifetime Poolside Basketball System - 1301 Water Basketball Goal - 44 inch Basketball Backboard. *Low price guarantee! We will beat any online, advertised delivered price for this kayak product. Add a new dimension of fun to your swimming pool with this poolside basketball system from Lifetime Products. 1301 features a portable base, which allows you to move the system wherever you want around your pole. The base can be filled with either water or sand. 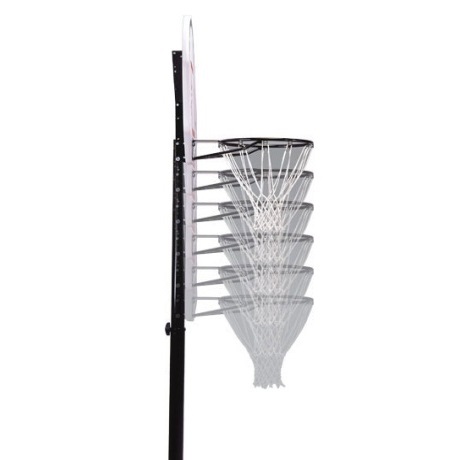 The backboard is made from fade-resistant, high-density polyethylene (HDPE) plastic. With a 44 inch backboard and a 27-gallon base, this system is ready to provide you a great way to play basketball in the swimming pool. You can use a full-size basketball with this regulation, 18 inch rim. All metal components are powder-coated to help the metal resist rusting. Adjust the rim height up and down from 4.5 feet to 6 feet in 6 inch increments to allow for different settings based on the players that are using the system, or the game being played. 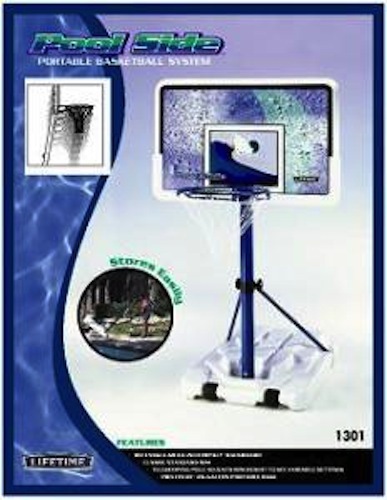 Order your Lifetime swimming pool basketball hoops here. 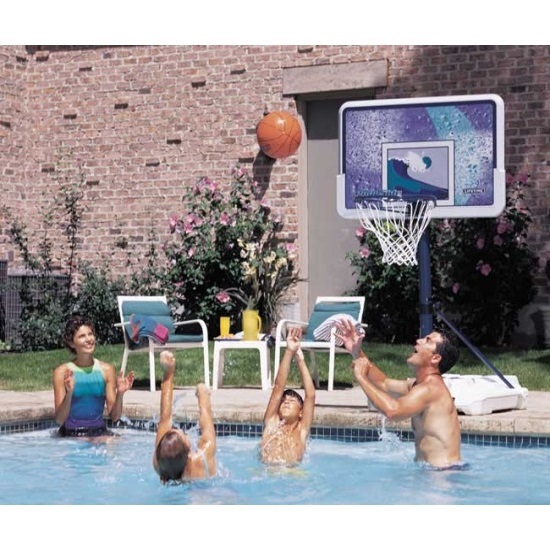 The 1301 Pool Side Basketball Hoop includes a 5-year warranty from Lifetime Products. 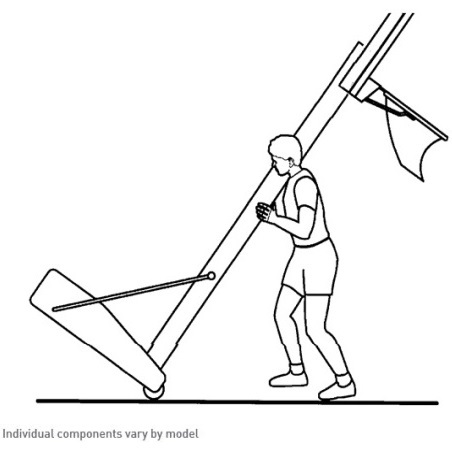 Please note that the picture for this listing illustrating a portable basketball hoop being moved is only to show how a portable hoop is moved to a new location. The 1301 poolside hoop is much shorter than the system depicted in the picture. Poolside basketball backboard material of construction: polyethylene plastic. Backboard dimensions: 44 inches W x about 27 inches H.
Rectangular-shaped basketball backboards typically provide about 25 percent more rebound area when compared to fan-shaped backboards with a similar width. Comes with a blue-colored classic rim and all-weather white net. Classic rim means the mount to the backboard is static with no spring mechanisms. Rim is a regulation, 18 inch diameter basketball rim. Basketball rim material construction: powder-coated steel. Backboard includes a frame pad for lower backboard protection. Graphics on the backboard are UV treated to help resist fading. Pool basketball system pole material of construction: powder-coated steel. Portable basketball pole construction: 2 pieces. The backboard is adjustable using a telescoping pole. Telescoping pole allows the rim height to be adjusted from 4 feet to 6.5 feet in 6 inch increments. Portable base capacity: 27 gallons. Portable basketball base footprint: 43 inches L x 30 inches W.
Portable base can roll for easy transportation and storage. Poolside portable basketball system weight: 52 lbs. 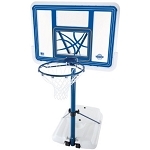 Shipping package dimensions: 44.25 inches L x 31.25 inches W x 8.375 inches H.
What a cool Basketball hoop, Quality! And super fast ship! Love it, Great Deal! This basketball hoop is like the outdoor ones but short for a pool. FUN!!! Thanks so much, I can now dunk a basketball. Thanks for the Basketball Hoop! My son will love it for Christmas! Q: This seems high to shoot from pool? Q: Are replacement poles available? 2 poles were MISSING from my kit! there's a hole in the box, NO JOKE! A: Yes, you can get replacement part by calling 800-225-3865. Feel free to contact us with any other questions. Q: If I order this today can it be here tomorrow? A: It takes on average 5-7 days to receive. Feel free to contact us with any other questions. Q: I'm trying to purchase online the lifetime goal at the advertised 109$ price but when it enters the Cart it goes up to 135$? Please help! A: I can't get our system to replicate your problem. Can you please try again? If you have issues please give us a call as it is getting the proper price when I added to the cart. Q: can I get this shipped to the country of Panama? Q: What is the difference between the 1301 and the 1306 water basketball system? A: All parts of these systems are identical, except for the backboard material. 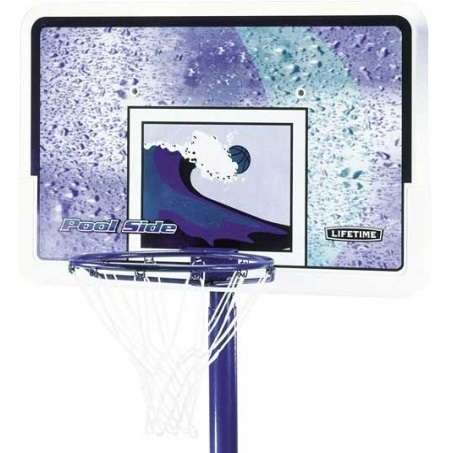 The 1301 uses high-density polyethylene (HDPE) plastic; the 1306 backboard is made with acrylic. HDPE plastic is opaque and more sturdy. Acrylic is a see-through material that produces a better rebound than HDPE. Q: What do we think about this hoop? A: This is one of our most popular lifetime goals. Use of this Poolside basketball goals provide great exercise and tons of affordable competitive fun. The Poolside goal model 1306 is considered to look nicer since it has a transparent backboard, but customers tend to go with this 1301 model since it plays almost the same anyway. 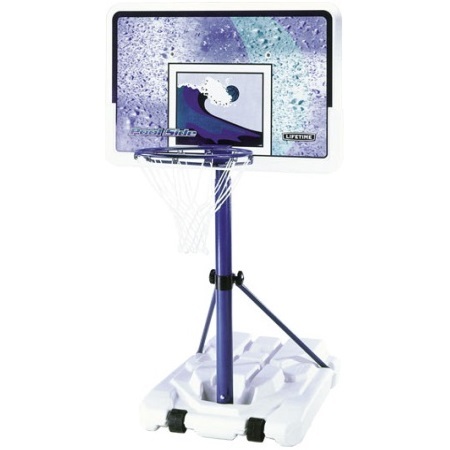 The backboard on this is a blow molded plastic board that can withstand countless hours of play and have UV protectants that wont fade with time. It is easily adjustable allowing for play in any pool and most ages. Keep in mind that if you need to store this while not in use it will be better to use water than sand as 360 pounds of sand is difficult to move. All in all this is a great product and possibly the best bang for your buck of all the Poolside water hoops. Here is a link to view the three models we carry. Fast Shipping: Orders for the 1301 Lifetime Portable Water Basketball System generally leave the warehouse the next business day.